Wellspring of ingenuity and creativity, the audience was bewitched by the modernity and the new artistic codes of the Opera as it spread into the superb Venice during the seventeenth century. Filled with the allegria or tragedia of the musical scores composed by the ingenious Monteverdi or with the machinery imagined by brilliant engineers to create living stages, there are powerful mechanisms behind the figurative and symbolic power of the Venetian opera. This upcoming project aims at revealing the symbols distilled in the masterpieces of the Venetian opera by studying the symbiosis between the scenography, the musicality and the lyricism through the historic context of the Serenissima. The results will be publicly available on a dedicated website which will extensively benefit from the latest breakthroughs in information processing. 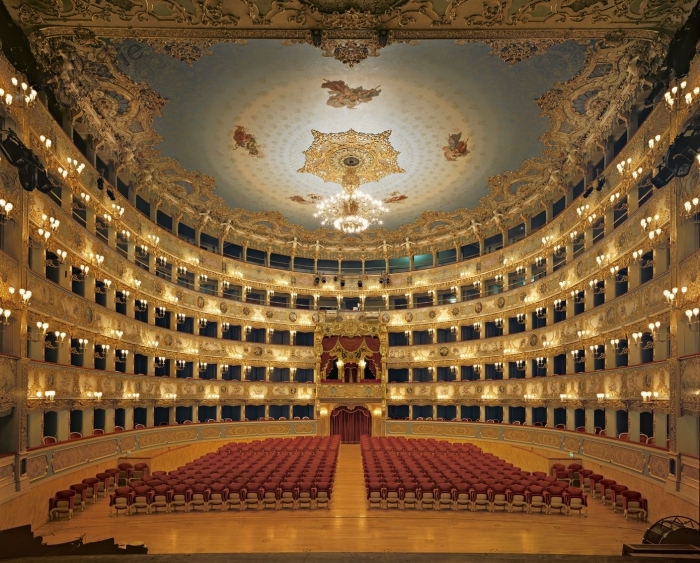 La Fenice, one of the most beautiful opera house in Italy, is a testimonial of the love of Venice for the art of Opera. Copyright: La Fenice, Venice. An opera performance is living and relational: each member of the audience produces his own genuine interpretation. It is an intricate piece of art which lives in a multidimensional space enriched by the play of the actors, by the lyricism of its texts or the scenography whose complexity was ever increasing. The theatres hosting these performances also witnessed subtle messages about the Republic of Venice: the main stage was the place where fears, joys and tears of its people could be expressed in a figurative or symbolic manner, whereas the location of the seats and spectators conveyed castes belonging and power relations between them. Numerous precise sources (archives, engravings, musical scores, etc. [1-4]) describe operas staged in Venice. The most innovative of them were directed by Giacomo Torelli, scenographer and engineer, who created machineries bringing the stage into life as a moving and changing set. The narration of this scenographic complexity is one of the core component of the current project. The themes, the sequencing, the emotions and rhythm of each scene will be put together into perspective in space and time, and they will be deciphered using the Venetian historical context. It will be, therefore, possible to understand the artistic intents of these works of art, but also to reveal the core operations underlying the composition. It is then up to the user to decide which direction to explore. Such correlations will help to better understand the symbols inherent to the Venetian opera. The system will be designed to provide high modularity in order to enable the addition of any component that could enrich the model later. It is believed anyway that in a first approach, the aforementioned components are sufficient to draw a first set of connections existing within the Venetian opera. The encoding of these sources relies mainly on new information processing techniques that are highly semantic: for example, MUSICXML can store musical scores processed if necessary with OMR (Optical Musical Recognition). The partitions will provide the relative time base for the temporal analysis of the opera works. Given the amount of data, one of the main concerns in this project will be the efficient design of a relational database. This goal of prime importance will be a milestone on itself as it will be explained later. The goal of this project is dual: on one hand, it will provide an efficient way to model the Venetian opera by proposing a semantic, open, modular and scalable model. On the other hand, it will propose a first application of this model enabling the user to draw a first network of semantic correlations within the Venetian opera. This model and this network will be brought to life dynamically using the latest web technologies like HTML5, CSS3 or jQuery and microformats. The aim is that the web visual experience connects closely the user to the experience offered by the opera, for example by giving an audio-visual transcription of the work if enough sources are available. In this respect, note that MUSICXML can readily be synthesized into music using some tools already available. Thanks to the provided interface, the user will be able to browse the content of one single opera or to apprehend it in the constellation of other contemporary performances to build logic bridges between them. The automatic processing tool beneath the interface will serve as a compass to reveal clusters, patterns and unknown directions in the understanding of the opera. If all the milestones are reached, one additional feature could empower everyone to reveal his own connections in the constellation in a collaborative fashion. The ultimate objective is to end up with an exhaustive fresco of the Venetian opera. However, in the context of the project of this course, we will restrict ourselves to five operas to be fully included in the model to ensure the feasibility of the project within the time limits. It will allow us to deliver an early working proof-of-concept to have a first functional evaluation of the system. Mid-February: Specs for the design of the database are set. The model should also be documented (first draft). End of February: the 5 operas are chosen (according to the quality of the sources, etc.) and their relative content is digitized in a relational database according to the format that was decided at the previous milestone. Mid-April: the web interface is ready. The content of the operas should be browsable. The quality of the documentation should be reviewed so that everyone willing to create an application for the model will be able to do so. Early May: the correlation strategy is studied and chosen. The historic context of Venice should be taken from a timeline or linked to another project. Begin of the correlative process. The rest of the time will be dedicated to the development of the application described using the model. Gombrich, E. 1953. Renaissance Artistic Theory and the Development of Landscape Painting. Gazette des Beaux-Arts, 53. Bonlini, G. C. 1730. Le glorie della poesia e della musica. Contenute nell‘esatta notitia de teatri della Città di Venezia. Venice. Rosand, E. 1990. Opera in Seventeenth-Century Venice: The Creation of a Genre. Berkeley: University of California Press. Bjurström, P. 1962. Giacomo Torelli and Baroque Stage Design. Stockholm: Almqvist & Wiksell. Leclerc, H. 1987. Venise et l’avènement de l’opéra public à l’âge baroque. Paris: A. Colin.